Modern technology and all its convenience also brings with it new health risks. The awkward or uncomfortable experience of texting with one hand could actually cause injury. Rachelle Bernier, a first-year biomechanical engineering graduate student at the University of New Brunswick (UNB), is currently studying repetitive strain injury (RSI) to uncover health implications associated with one-handed texting. Early findings suggest the more one-handed texting a person does, the worse the RSI gets. When a person texts with only one hand they are trying to support the phone in an awkward way, Bernier said, and the angle and reach of the thumb and wrist can cause injury. And while one-handed texting poses a risk to everyone, it has an especially negative impact on amputees who have no choice but to text one-handed. The project requires participants to text various patterns on a cell phone fitted with force sensors. Using 3D motion capture, she’s also able to collect the angles of the wrist and thumb. Bernier is then able to work backwards to calculate all the forces through a person’s joints, thumb and wrist. This action is completed by able-bodied participants as well as amputees in an effort to compare two-handed texting to one-handed texting. She’s hoping having both sets of data will prove texting with one hand is more awkward and creates more strain. With knowledge of how and when RSI may occur, Bernier plans to provide preventative measures that will benefit a large part of society. 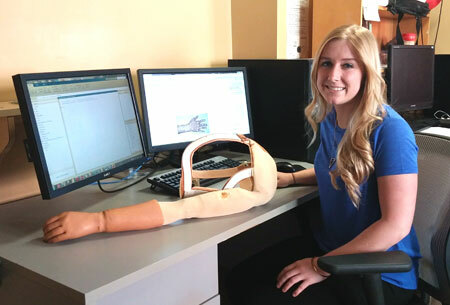 Bernier has a personal connection to the study and keeps a prosthetic arm on her desk to remind her why she’s chosen the career path she’s on. Bernier’s mother, Marjorie, is a congenial forequarter amputee. Growing up, Bernier watched her mother complete her day on her own. While Bernier took over the research from UNB student Reza Alavi, her mother remains an inspiration for why she does it. Bernier always wanted to be an engineer, but having the opportunity to help people achieve their goals is her new focus. Bernier’s passion for helping people was first realized when she saw Dolphin Tale, a true story of a prosthetist who creates an artificial tail for a dolphin. Bernier discovered Dr. Kevin Carroll, the real-life prosthetist, and his association with a summer camp for children with limb loss. 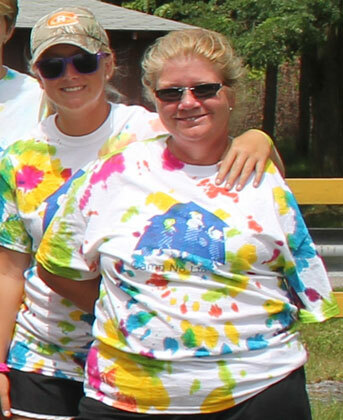 She and her mother volunteered at Camp No Limits in 2013. Bernier saw kids ride their bikes and run for the first time, all thanks to the physiotherapists and occupational therapists at Camp No Limits. The next year Bernier, who is originally from Port Hope, Ontario, attended the summer camp again when it was hosted by Camp Rotary in New Brunswick. It was there that Bernier was connected with Wendy Hill, an occupational therapist at the Institute of Biomedical Engineering, who told her about the RSI texting study at UNB. Alavi, the student who originally worked on the study, previously discovered the farthest reach and the nearest reach of a thumb had the highest forces during one-handed texting. This study, as well as others, discovered when the thumb is at the highest range of motion it’s at its most susceptible to RSI because the contact forces are highest. However, Bernier’s research is unique because it combines two separate studies.